Expert roundup posts have become more than just trendy. Let’s clear up some of the biggest myths about them. These days, you rarely hear the word “roundup” without the word “expert” in front of it. These expert roundups typically feature a large number of people responding to one or two questions, and all their responses are published verbatim. If you quote 50 people, all with a social media following, you have 50 influencers with a vested interest in promoting your post. 50 participants means 50 perspectives, giving readers more options. You don’t have to come up with all the ideas, just the basic premise of the post. This is a great way to network with 50 influencers in your niche. But there are also a number of myths surrounding expert roundups, so let’s clear the air on seven of them. MYTH #1: Others do all the work for you. Come up with a topic and a good question or two. Collect email addresses or other means of contacting each one, which I find is the most work. Send email or message to each one. Respond to questions any invitees might have. Keep track of each answer or input as it comes in. If you have asked for a photo, keep track of the photos. Keep track of who has and who has not responded. Follow up individually with each invitee who had not responded. Assemble the post, with each name, affiliation, photo, link and input. Create at least one nice image for the post. That’s just to prepare the post for publishing. That does not get into the extra job of encouraging each of the participants to promote the post. Nor does it get into the job of tagging all the participants when you share it on Facebook, LinkedIn, Tsu, Twitter or Google Plus. All the communication involved can often take longer than just writing the post yourself. Myth #2: You need at least 50 participants. The fashion these days is to publish long roundups with over 50 participants, sometimes even over 100. We should have seen it coming, since there seems to be an arms race going on over blog post length in general. The logic, for expert roundups, goes something like this: If 50 participants means 50 people promoting the post, 150 participants means 150 people promoting the post. If Joe Shmoe has 50 people in his roundup, I can outrank him in the search engines by inviting 150. If 50 participants makes “the ultimate guide” on something, 150 participants means “the ultimater guide” (at least until somebody invites 250 people to their ultimatest expert roundup). Just to put things in perspective, I invited five people to participate in this expert roundup that you are reading now (that’s what this is, I suppose, having invited seven experts to provide input). And one of my most successful posts was where I asked four writers I knew about what habits make them awesome writers. There is no rule about how long a blog post should be, nor about how many participants it take to make the ideal expert roundup post. This is a common myth that keeps some people from jumping into the expert roundup game. Much of the work is in direct proportion to the number of people you need to contact and coordinate. Codrut Turcanu, who has probably coordinated more expert roundups than anybody I know, says that many people he has spoken with believe that real experts are hard to find online. He doesn’t seem to have a problem locating experts, but if you limit participation to just a few people, as I do, you can reduce the amount of work and the likelihood of errors at the same time. Another step you can take, if you are open to walk-in participants, is to use MyBlogU to gather replies. I did not use MyBlogU for this post, because I had specific people in mind, but I did seek input on other articles, such as this one on blogger and writer health tips, and I have participated in several MyBlogU expert roundups, such as what to do when you have too many writing ideas and how to create quality content. Some bloggers like to feature the headshots or avatars of the participants. I prefer not to, as I like to incorporate the answers into the post itself. This is actually more work than just cutting and pasting the responses, but I find the post has a better flow. Nevertheless, not all expert roundups feature images of the participants, so you can reduce your workload by leaving these out. Would you lose some of the benefits this way? I am not sure. If anybody has experience with this, please leave them in the comments below. Myth#4: Expert roundups fetch more comments. My observation is that some participants will drop a “thank you for including me” comment on the post, but they are more likely to leave the comment somewhere on social media. Luana Spinetti says she was afraid that several intended participants would be too busy to participate in her roundup post on improving display ad conversions. “It’s a huge fear, one that I face every time, but that has proven unfounded. Experts are happy to get a chance to spread the word about what they do, so they will most likely take up the opportunity as soon as you throw it at them.” And for the shy types, she points out that there are always platforms like MyBlogU and HARO. Jimmy Rodela, freelance writer and founder of GuildofBloggers.com, has come across a similar worry, that experts won’t respond to somebody who is “a nobody online”. But in his experience, that is 95 percent false. The key is to make it clear how they will benefit by participating. “Even if you are a nobody online, if you’ll tell your target influencer that they will get a brand new car should they decide to join your round up, there’s a HUGE chance that they’ll join, right?” While your reputation can get their attention (or get you ignored), what you have to offer and how the influencer will benefit will make or break your pitch. Tom Treanor and I were involved in a discussion in a Skype chat room recently, where some people were questioning the value of participating in expert roundups. The sentiment expressed by some people was that a blogger was cold-calling them, asking for free content. Their impression was that it was a one-sided deal, and definitely not worthwhile unless the host blog was popular. He pointed out that being seen with other influencers, as in this post at UKlinkology, has its own rewards, as long as the blog has a minimum level of professionalism, traffic and social shares. Some people might feel that expert roundup blog posts have been overdone, but they could just use their imagination to present them in fresh ways. For instance, you could ask everybody to send in a video clip, and you could splice together an expert roundup video. Similarly, you can put the responses together in a slide show, such as the one Wrike put together on building a company culture in a start-up. Have you come across any other myths about expert roundups? You are invited to share your experiences in the comments below. The post is indeed a timely one! You brought out some of the myths prevalent among the bloggers in relation to Roundup posts. Other myths like getting more comments with a roundup post too is a myth! As I mentioned my experience in the post it is another great myth. I am sure the bloggers who plans to do such roundup posts will surely get an idea about such myths with this post. David, It is indeed a great joy to be a part in this post. Thank you so much for the kind invite you extended to me to air my views in this regard. I just re-shared this into some of my social sites, it fact bloggers need to know more about such myths and its reality. 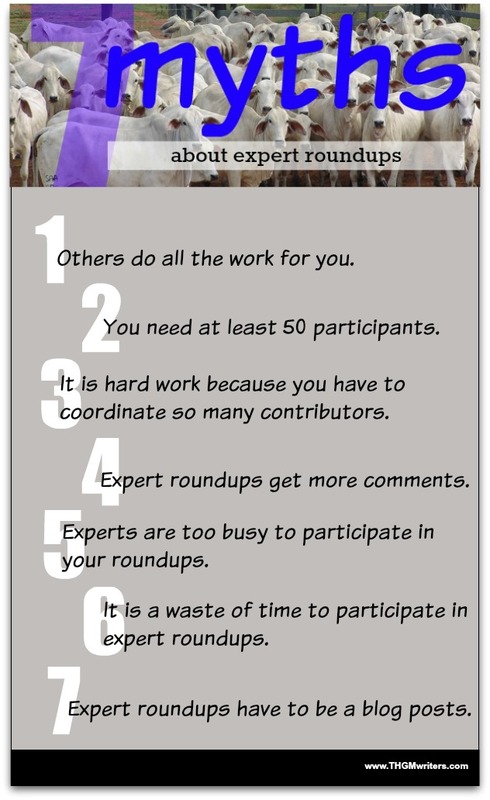 Thanks for bringing out such an elegant roundup post in busting the Myths about Expert Roundup posts! Great post about expert roundups. I confirm that influencers reply even to a newbie. I’ve done a roundup on my new blog last month. I reached out to many successful bloggers that never probably heard of me before, and they still accepted to answer me. Some of them actually asked to me to contact them again for the next roundup. I liked the idea of making a video roundup, but I think would be much more difficult and that much harder to find people who accept the invitation. Another problem that may appear in this case is the fact that many bloggers aren’t English native and may refuse because of that. Your post is great. I’m heading to twitter to share it. Great piece David. As you know having participated in some of my round-ups yourself, I am a firm believer in the value of this type of reporting and agree with you on all points. One additional thought is that the writers of such pieces can’t provide this level of content unless they are firmly entrenched in their subject matter. So, they have also have to be an expert in their own right – and it’s based on their credibility that other experts will agree to lend their name and thoughts. Yes, there are lots of myths surrounding expert round-ups indeed. Personally, I often refuse to do this type of post because of the idea of stressing out coordinating experts from different backgrounds. In this case, I will say I am a victim of Myth #3: Expert roundups are hard work because you have to coordinate so many contributors. Now I know better! From this post,my mindset is changed and I have better perspective of what it entails to have an expert roundup! Will the blog carnival meme get popular again, you think? Martin, I suspect that the days of bulk blog carnivals are over. Blog carnivals used to be ridiculously popular in the personal finance niche, but none of the three carnival aggregator website I was familiar with still exist. I know of a couple blogs that still do carnivals, and I think they are more effective now than when everybody was doing it. The value in them now would be in curating just the cream, rather than publishing every post that is submitted. Great piece on roundups. I have to say, there are truths to many of these myths. I host the Passionate People round up yearly and there is so much time and work behind it. Although in the end overall it is extremely worth it. I don’t put emphasis during these engagements on the traffic. This segment for me is about networking and awareness for my readers. It allows my audience the benefit of an added perk when coming to my site. Just my two cents on the topic. I think sometimes these get very overrated and sometimes more of a clicky popularity tactic among networking groups which could wreck credibility of a roundup possibly. You need to create it strategically and wisely. Thanks for the content and knowledge. You nailed it my friend. Great piece. I find it educative. I am still learning. Expert roundups is not an area that I am familiar with, but reading you now, I certainly can see the possibilities involved. The way I look at it, whatever strategy you can use to grow the reach of your blog without scamming your audience should not be sneered at. Thanks for giving us an insight on this topic. David, just hopping by to thank you for including my contribution and for coming up with THIS post, because it’s one I need to read and re-read often when confidence goes miles below my feet. I’m way more confident now about expert round-ups, but some days are just worse than others, I suppose? I like experts roundup posts because I do not need to go elsewhere for reading best content they deliver to their readers. I do not know how they make experts roundup posts, but they help me learn more things from them. I am so sad you missed my comment! Somehow you missed to read, I mean to say no response to my comment! Hi Phil. No response doesn’t mean a comment wasn’t read. It just means I was not inspired to say anything. I tend to let people’s comments speak for themselves. 7 top myths about round up posts. What only 7 I thought? I was dead curious, I began to read. (Terrific title BTW). Right, creating round up posts is a lot of hard work. coordinating with the right Blogger, sending out emails, following up. Tracking the content sent in via an XL sheet. Tracking images and mapping them to content using an XL sheet. The list of things to do to get a round up post, spot on, can make a grown man (or woman) weary. Like you said, this is just getting the post ready for publishing by a specific date. Then comes the other part of encouraging the participants to market the post on their social streams so that your Blog post can get broader visibility. All too often, the marketing of your round up post on participant’s social media streams just does not happen. Perhaps, the participants themselves realize that they will be marketing a ton of other EXPERTS to their audience. IMO that can be a huge barrier. They are also aware they have at best added 8 to 15 lines to a lengthy Blog post. The info snippet size being too small to trigger any sparks among their readers. My opinion is that Round Up posts are really a waste of time for the Blogger creating the round up and the Blogger contributing to the round up. It’s a marketing technique, which has (sort of) lost its flavor. Sure there was a time when it worked, BUT (IMO) that time has passed. If the Blogger who crafted the round up post is to brutally truthful, I seriously doubt they would be able to measure / quantify – Their Gain – from a round up post delivered by 50 to 100 people. Hi, I just had a question about expert roundups. If you’re doing 50-100 of them, should you make them nofollow or keep them dofollow?